Opal has tickled the “faux rock” area of my brain since Donna Kato offered her free online tutorial. Camille Young, Randee Ketzel, Liz Hall and others devised their recipes. My husband’s turned walnut bowl and a looming show deadline gave me the perfect opportunity to try out my own color combinations and mixtures. Though I learned along the way and would do some things differently, these ideas are finally out of my head and strewn about my studio. It’s been a long time since I’ve shared with you and I want to start the year right. Party tonight over at Craftcast where the group from the Polymer Clay Master Class book will gab and guffaw. Lots of prizes and fun. Join the gang! Oh I just love it. Thank you for sharing. That is a beautiful piece! Nice that you work together with your husband! Thanks for showing us your muse results! Your work on this piece is simply stunning! You do amazing things with polymer. Thanks for sharing your work with us. I’m so glad you shared your work, and the work of your husband, with us! The colors that you have achieved on this piece are absolutely wonderful! Makes me feel like I better get myself kick-started for this new year. Thanks! A beautiful pairing of gifts! I would love to know what you would do differently now. Thank you for sharing your work, it must be a joy to create with your husband. It’s such a lovely piece. Brilliant and beautiful…love it when you show your own work! WOW, love it, there is just something about polymer and wood together and the fauxopal is gorgeous! Love the bowl, love the combination of materials, love that you and your husband work together as a team! Its Really nice to see your work here too !!! It’s a head “turner” !!!! Beautiful Cynthia! I have been playing with the opal lately too. Isn’t it amazing? Cynthia, it’s beautiful and stunning !!! Love it. Gorgeous presentation by both of you, Cynthia. I wish I was close enough to see the show in person. Maybe you could post photos for us? How wonderful you can combine your talents so harmoniously! This one has an Arts and Crafts era vibe. Frank Lloyd Wright would be proud. I absolutely love it. Thanks for this inspiration piece! Janet – We’ve been inlaying bowls for over 15 years and only put one in the oven. We learned that lesson fast! The others have been very thin layers cured with a paint stripper gun. 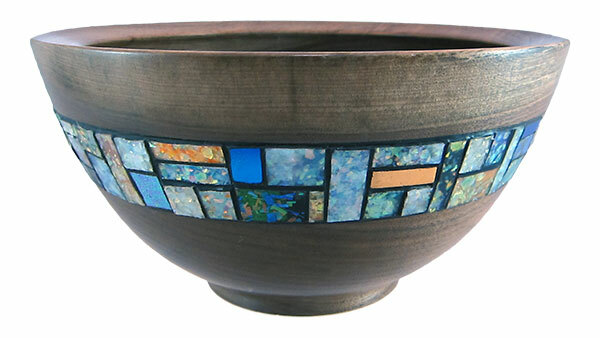 This mosaic is a combination of baked in and pre-baked. The tiles were pre-baked, the grout fired in place. That is amazing. Your work is so beautiful! The colours, to die for! What a fabulous bowl. Thanks for sharing. Way to fuse the muse! Truly gorgeous, I just love how polymer clay contrasts with wood surfaces, so stunning!